After reading Paul Krugman’s attempt to grapple with Functional Finance, I happened to browse through Wendy Carlin and David Soskice’s macroeconomics textbook. This book, I should note, comes with the endorsement of Simon Wren-Lewis. I was surprised to find in it the mechanics of Functional Finance clearly explained in terms of the mainstream theory, specifically the ‘3-equation model’ — a version of the ‘New Consensus’ model. Caveat! I don’t endorse the assumptions behind this model! I’m not taking a view! I’m not an economist! I’m just trying to show one way that the debate might be framed in a way that doesn’t require a wholesale rejection of mainstream macroeconomics. The situation modelled here is precisely the Functional Finance one: the interest rate, r, is fixed at a given level r_s. In the textbook this is explained in terms of the ‘Zero Lower Bound’, which means that ‘monetary policy is disabled’. But there is nothing in the model to rule out the disabling of monetary policy by political means. And, as I’ll try to show, if you go through the ‘bad’ scenario proposed here, you realise that monetary policy must be assumed to be disabled politically rather than by the economy being in a natural ZLB condition. Since r doesn’t move in these examples, it’s up to the fiscal authority to stabilise output. It is assumed to follow a policy rule (PR), which matches different levels of output (y) to different levels of inflation. This makes y decreasing in π, so that the fiscal authority is effectively trading off inflation against output, mirroring the loss-function of the monetary authority in the ‘New Consensus’ assignment (earlier in the book you have the same figures with an MR curve instead of a PR one). The equilibriums in the bottom graphs are where this PR curve meets the Phillips Curve (PC), which reflects the assumption that higher levels of output-growth are associated with higher expected levels of inflation (π^E), which in turn drive actual inflation. This is explained elsewhere in terms of the labour market (pace heterodox economists). The top graphs represent the IS relationship between the interest rate and the rate of growth: the IS curve slopes downwards since lower r is associated with higher y and vice-versa. On the left of the figure, we have a model of successful Functional Finance. First we imagine a negative demand shock — a recession in plain terms. We begin at point A, then the IS curve shifts to the left, taking us to point B. On the bottom graph, the shift from A to B runs down the PC, towards a lower level of π: π_0. The fiscal authority spends more to drive towards a higher level of output, y_1. It thus pushes the IS curve rightwards to arrive at point C.
Meanwhile the PC drops, as backwards-looking agents incorporate the new π into their expectations. Thus point C on the bottom graph is at the intersection of the new PC and the PR. But this isn’t the end of the story; the government has spent so much that output now exceeds capacity, causing inflation and driving π up to π_1. Agents incorporate this increase into their expectations in the next period, driving the PC up again. The government, which targets inflation at π^T, will keep cutting back its fiscal stimulus until the IS curve ends up back where it was. At this point prices will stabilise and so will the PC. We’re back at point A. Here is successful Functional Finance: the fiscal authority has responded to a shock by stabilising output and inflation back at its target levels. 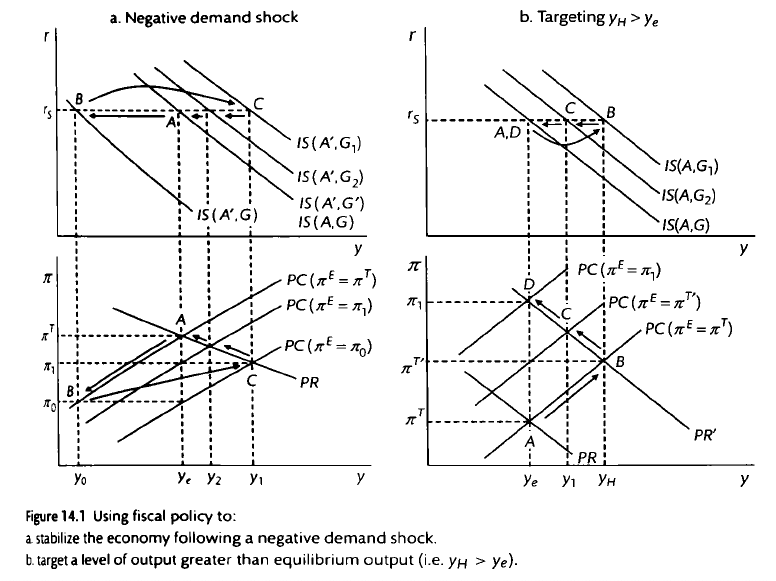 A similar model could show the fiscal authority responding successfully to a positive demand-shock. The right-hand side of the figure shows a very different scenario. In this case, the fiscal authority targets a rate of growth beyond capacity, y_H. Beginning again at A, it pushes the IS curve to get to B. This also means changing its policy rule from PR to PR’. The result is increased inflation, agents modify their expectations, and PC goes up. The inflation-targeting fiscal authority reduces spending and IS goes leftwards towards C. But spending is still above capacity, so the PC goes up again. Eventually we end at point D, where the new PR’ intersects the PC at the capacity level of output (y_e). Were back at point A on the top graph (which is also point D), but on the bottom graph we’re at a higher level of π (π_1). You could draw a similar figure to show how the attempt by the government to target some y_H below y_e would get us back to y_e but with a below-target π. This is a failure of Functional Finance. But notice that it has nothing to do with r being >g, exploding debt, etc. Why, in this stylised scenario, doesn’t the monetary authority raise interest rates to deal with the increased inflation? The answer is that, as I said, the model has r fixed to disable monetary policy, and not just because of the Zero Lower Bound. After all, if it were simply a matter of the ZLB then the inflationary fiscal expansion would drive us off the ZLB and monetary policy would kick in. It doesn’t, because here, implicitly, monetary policy has been replaced by the Policy Rule of a fiscal authority targeting output and inflation. Thus this is an inadvertent model of Functional Finance. The important question is: what makes the difference between these cases: the success on the left and the failure on the right? Again, it’s not a matter of monetary policy (which has been disabled) nor the interest rate (which has been fixed). Rather, the problem case occurs when the fiscal authority changes its policy rule to target an unrealistic level of output. Why does it do this? Later in the chapter there is some freewheeling political science about ‘deficit bias’ in fiscal authorities. Others can debate these questions of political science. It’s worth noting that the most famous current school promoting Functional Finance (Modern Monetary Theory) recommends using automatic stabilizers, especially the Job Guarantee, to keep fiscal policy on track. And the book itself discusses fiscal rules that can keep the fiscal authority to a particular PR curve. Beyond freewheeling political theory, there is a vast game-theoretic literature explaining how discretionary policy is inherently subject to time-inconsistency and thus to inflationary bias — Kydland/Prescott, Barro/Gordon, and the literature that followed. This literature is usually interpreted to be about discretionary monetary authorities, but it could just as well be about discretionary fiscal authorities. That can be equivalent either to the MR curve or the PR curve in the above 3-equation model. Either way, the policymaker’s utility is a function of the excess of employment, y, over some ‘natural’ level (the level consistent with stable prices), and a quadratic function of inflation, π. Inflation gets worse as it grows. Barro/Gordon seek to prove, using a game-theoretic argument and the assumption of rational inflation-expectations, that a discretionary authority aiming to maximise that utility function will end up with a higher level of inflation, with no compensating increase in output, than one that can commit to a rule. Thus it will end up with lower utility. If you accept that result, and you can show that it is easier to make a rule for central banks than for fiscal authorities, then you have an argument against Functional Finance. So if there’s to be a debate with ‘the mainstream’ over Functional Finance, I think that’s where it should be situated.